Product marketing is facing a number of challenges today and one of those challenges is to justify marketing investments. How often are you being asked to explain why the company should invest in marketing activity ‘X’ over marketing activity ‘Y’? In the business world say “I feel really good about it” is not enough justification to support an investment. In this article I’ll get to root cause of why justifying marketing investments is so hard, and what you can do to fix it. Yes, it’s true. Many product marketing managers guess at what they believe is the best way to influence buyers. Yesterday they read an article that said email marketing is the way to go. The article probably had compelling statistics to boot. Or maybe there was a webinar that talked about the wonders of a community and how it will end all your problems. There’s too much guessing going on in the name of experimentation. I’m all for experimentation, and you should be too. But experimentation starts with a hypothesis, not a guess. It’s reasonable to assume that a set of marketing activities that worked at another company should work again. When you have evidence that something works why not do it again? When you go up to the plate and take 3 swings and strikeout, what do you think happens when you try that technique again? It’s not going to be credible. When the sales team requests something from the marketing team, you’d think it must be important and necessary. After all, the sales team spends more time interacting with customers than anyone else in the company, right? They should know best what they need. The words ‘important’ and ‘necessary’ have relative meaning. To members of your sales team, they are important and they are necessary. To win a deal. Your focus is on winning all deals across a market segment. Leveraging the market insights of your sales team is valuable. Relying on it as the primary source of justifying marketing investments is not. Just look at the inventory of product marketing resources your company has built over the years. Used once and never referenced ever again. The problem is a lack of market insight, by product marketing managers, about buyers and why they do what they do. To overcome the lack of insight, we guess, we try things that worked before, and we ask the sales team what to do. How’s that working for you? Is your budget growing? Is your team expanding? Are the products you support hitting their numbers. Much has been written about buyer’s journeys, but they fall short. Most focus on aligning content and sales tools with little insight on buying behavior. Buyer’s Journey Decision Maps close that gap. It’s like you plugged in an address into your GPS and it told you the most efficient route to take. Only this route is the fastest path to making a buying decision. Using a Buyer’s Journey Decision Map you can identify gaps in content that are slowing or stopping a buying decision. You can identify opportunities for more compelling sales tools. You can influence pricing. You can inform the development of product features. And you can structure more effective sales enablement training. 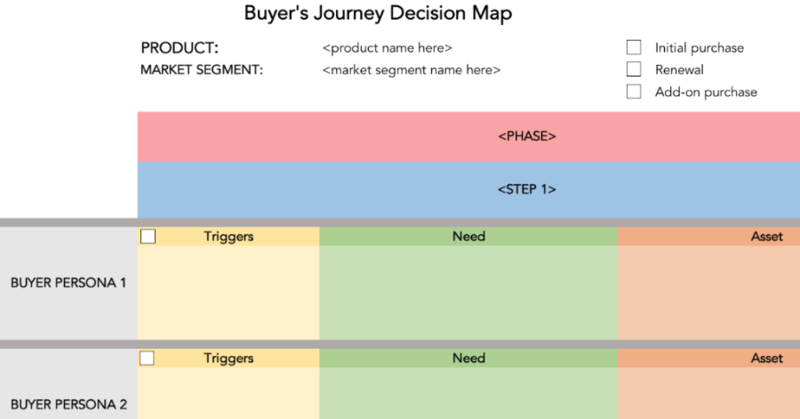 A Buyer’s Journey Decision Map helps you confidently just marketing investments. You have the market insights to know where and how buying decisions are delayed. Sometimes it’s because buyers can’t get what they need to move forward. Sometimes it’s because our selling approach is slowing them down. BrainKraft just announced the Buyer’s Journey Decision Mapping course and it’s available at the BrainKraft School . The course is a self-paced video with small lessons. Each lesson is <10 minutes. Take it anywhere on just about any device. In the time it would take you to search the web and figure out what works and what doesn't, you could take the course and complete a rock-solid Buyer's Journey Decision Map. The first 10 new members of the BrainKraft Tribe can take the class for free - a $299 value. All you have to do is sign up for the community and I’ll send you a note with a coupon to take the class at no charge. All I ask is that you take the class and provide feedback. If you like it so much you'd like to give a testimonial. I'm all ears. The Buyer’s Journey Decision Mapping class is available with 3 options. The first option is the class only. The class has a lot of practical, actionable tips, methods, and tools. The objective behind the class is to share ways of building a Buyer's Journey Decision Map quickly and accurately. You don't want to turn it into a massive research project. You just want to get it done. The second option is with a review of 1 Buyer’s Journey Decision Map after completion of the course. The review involves examining your buyer’s journey and providing feedback to make improvements. The third option is 5 hours of 1-on-1 live coaching with me over the internet (or one of the BrainKraft brainiacs) to accelerate the development of your Buyer’s Journey Decision Map. The coaching sessions guide you through topics in the class, to help you move you along faster.